A couple of folks, Kenny and Claire, opted to walk on Friday too. They caught the train/bus to Lagangarbh and then walked to Kinlochleven via the West Highland Way, Stob Mhic Mhartuin and the 903m point. They had great views and weather. On Friday night the forecast for Saturday suggested early snow and rain would clear into a reasonable day by 10:30am. Alas by Saturday morning the “reasonable” part of the day had shifted back to mid afternoon. Most folks chose to take the optimistic view on things and headed for the hills regardless. A large party consisting of Alison F, Tony, Ken, Allan S, Kate, Emma, Monty and Claire headed for Glas Beinn. They crossed the new hydro dam at Loch Eilde Mor via a pallet board, and trudged up snowy wastelands to the beehive summit, meeting a runner who followed their steps on the way down. Most folks slipped at least once on the way down to the river Leven path and Claire was so cold that she needed both hot chocolate and cake in the Ice Factor. 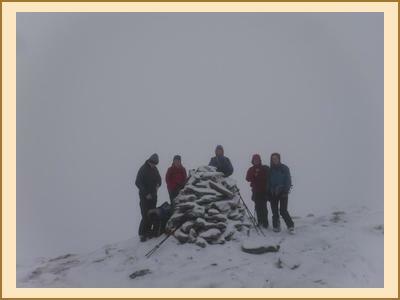 Dave and Pauline did Binnein Beag, Kenny, Anne and Alan post-poned departing for as long as possible in the hope of better weather and opted for a wee hill, Meall na Duibhe, straight from the hostel. Chris and Katrina headed for Mam na Gualainn and tagged on an extra Graham for good measure. Marcus, Rob and Sylvian headed for the Ring of Steall which took a bit longer than expected. Mike and Fiona R combined Garbh Bheinn with Meall Dearg a small bit of the Aonach Eagach and then walked along the ridge over Am Bodach and the 903m point to pick up the West Highland Way back to Kinlochleven. Despite various signs that the sun might make an appearance pretty much everyone remained in the clouds all day. Alison C and Fiona M took a more pessimistic view of the weather forecast (they clearly knew something the rest of us didn’t!) and opted to spend the day climbing at the Ice Factor. After 20 routes they looked almost as wrecked as some of the walkers! Clare A joined them for a bit and also did a session on the ice wall with an instructor. Despite having had the longest day of all Sylvian still somehow found time to make a really delicious pastry desert for us all to share in the evening, basically puff pastry and lots of almond paste in the middle. He claimed it hadn’t quite turned out how he’d wanted it to but I thought it tasted great and the fact almost all of it had been scoffed suggests no one else had any complaints either! Sundays forecast suggested 80% chance of cloud free Munros and a very decent day in prospect. A few folks were therefore somewhat perplexed with the drizzle and low cloud that we awoke to but again optimism that it would improve sent us off up into the hills once more. Chris headed off on a monster trip to bag two Grahams and a Corbett. Katrina and Claire walked with him to begin with before heading for Sgurr Eilde Mor, sliding around on the boulder fields where they got some tantalising glimpses of a view. The continued on to Binnein Beag with the snow-covered ankle-breaking boulders making slow progress on both the ascent and descent. 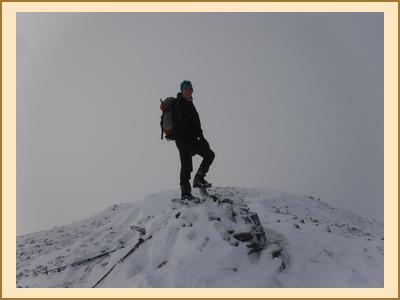 Their ascent of Binnein Mor was pretty treacherous, with fresh snow covering rock hard icy stuff. Claire went for a wee slide on this but thankfully without hurting herself. They topped out on Binnein Mor into the setting sun and an exquisite view across the Ring of Steall, quit whilst ahead and had an ounce of daylight, coming back down Sgurr Eilde Beag and the path and entering Kinlochleven with a bunch of army squaddies. Alison and Kenny headed off for Beinn Sgulaird, Anne, Alan and Fiona M headed for Glencoe with Creise, Clach Leathad and Meall a Bhuiridh being their objective. Sylvian and Rob had some navigational issue but eventually climbed Broad Gully in SCNL. Marcus was too wrecked from the Ring of Steall to join them so went for a walk to the Grey Mares Tail. Kate, Emma and Allan S had a lovely day going up Am Bodach in the Mamores. Monty and Clare headed for one of the Ballachulish Horseshoe Munros. Ken and Alison F headed for the Pap of Glencoe. Tony headed for Mam na Gualainn. Mike and Fiona R started off with a rather ambitious plan. They headed up the Zig-Zags on Gearr Aonach then onto the summit of SCNL. They had planned to continue to Bidean nam Bian and beyond but clag induced apathy resulted in a change of plan and instead they wandered around the coire and then sat watching all the climbers for a while. Views or no views it was a great weekend and great company.